Up to the age of eight weeks, puppys spend all of their time with mom and littermates. 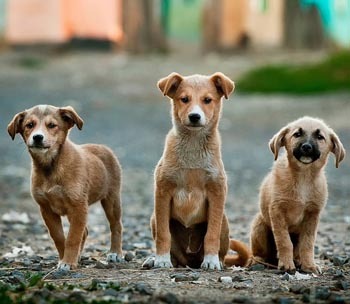 During this time puppies learn how to correctly interact in a variety of different situations. They also learn proper social behavior through play. Young pups also learn to accept discipline from their mom for their improper actions. It is also during this time that they learn not to relieve themselves in the den. It is strongly advised that puppies remain with their mother and littermates through at least the age of 8 1/2 weeks. During this period of time a puppy’s mind is like a big sponge. The most rapid learning occurs durning this time. 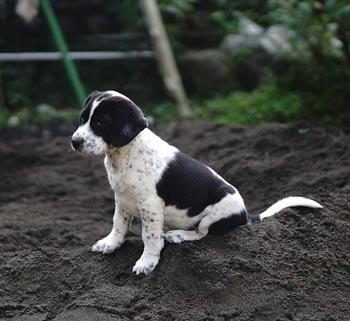 A puppy’s long term memory is established during this time. This is the perfect time to start basic training. A puppy’s attention span is very short, so any training should be done in short segments of one to three minutes. Remember, any training you do must be fun for the dog or it will not want to learn. This would also be the best time to start introducing the puppy to other important things in its life. After the initial bonding period has been completed, take the necessary time to introduce your puppy to new things. Things like new people, places, other animals, cars, the washing machine and other unusual items in it’s world. At this age, puppies are driven by curiosity, so they don’t usually have a fear of to many things. If you take the time to introduce all of these things in a positive and non-threatening way, you will have a more confident dog as time goes by. 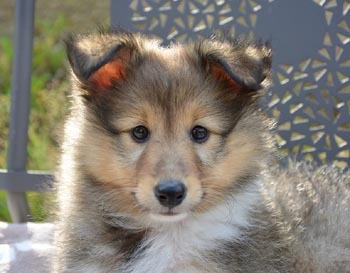 From five to eleven weeks any traumatic, frightening or painful experience can have a more lasting effect on the puppy. It is advisable that you avoid or at least minimize any situations that might frighten, traumatize or cause pain. If handled incorrectly, you may instill a lasting fear of the things that frightened it. (car horns, loud noises, the vet etc). Never coddle, or over sympathize with the puppy if it shows a fear response. If you have an already timid or fearful puppy this can further ingrain the fear and make it harder to remove it later. We suggest that you simply say “It’s OK” or “You’re Fine” and then redirect the puppy on to a positive activity like training or a play session. One other point needs to be mentioned. The period between six and sixteen weeks can be a dangerous time for a puppy. Above all else, a puppies health issues must take center stage. Just one sniff at a location where a sick dog has relieved itself (within the last 6 months) can infect your puppy with the parvo virus or another life threatening disease. For this reason, when introducing new things, places and dogs, use your common sense. Only introduce it to places and dogs that you know are completely healthy. Puppies start to cut their teeth about this time, so by now you should have discouraged all biting and your puppy should have learned bite inhibition. It is also important that the bond between you and your puppy be fully established. If its not, this should become your top priority. If you don’t have a strong bond you will be in for a few very tough years. This bond of mutual trust and respect allows you the access to teach your puppy the things it needs to know as well as the behaviors you expect. With your consistent “parental like” leadership you will make leaps and bounds in your training. The eight to sixteen week period is the most important time in your dog’s life. It will learn more during this time than it will at any other time in it’s life. Most behaviorists feel that the personality traits that your dog exhibits at sixteen weeks will accurately reflect what it will be like as an adult dog. The only way to change an unwanted trait will be extensive training and/or behavior modification. So it is important that you work hard to give your puppy the best start in life possible. 4 to 10 Months – Independence Days. All of these things are fairly harmless, but they can also be deadly if your puppy decides to run into the street at the wrong time. For this reason it is very important that you keep the puppy on a leash at this time if you are not in an enclosed area. Daily training sessions are a must during this period of time. 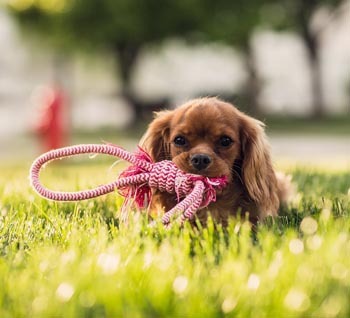 The amount of training you do and the amount of time you spend interacting with your puppy will directly determine how well it will mind you when you ask it to do something. It is now thought that puppies become teenagers at about 10 months of age. This goes along way in explaining some of their actions! Almost all breeds are physically fully grown by 12 months, but may take a few extra months to “fill out” completely. Dogs who are not properly trained and socialized as young pups may now begin to exhibit some increased aggression, resource guarding and may even try to test your authority. But if you have done all of your homework, trained consistently on a regular basis, and spent lots of time hanging out with your dog this should not be a problem. Actually, you most likely will not even notice much of a behavior change at all. Continue to train your dog consistently and on a regular basis every day. This will keep the lines of communication open and you and the dog will continue to build a stronger bond. Regular outings and play dates with other friendly dogs is a must throughout the dog’s life in order to keep it properly socialized. No matter what your reason was for getting a puppy, it is your responsibility to provide a safe and secure environment, provide leadership, and train it so it will develop into a well-mannered dog and a trusted family member. If you are not prepared to make a ten to fifteen year commitment, you need to rethink this whole dog ownership thing. Over the past few thousand years dogs have been bred to interact directly with humans. While they can read our emotional state of mind and our body language … they can’t read our minds. They need us to tell them what we want. In order to communicate with your dog you need to have a bond with it and then become it’s teacher. And the teaching and training doesn’t end at 6 months or even 24 months. Teaching your dog is a lifetime job. Your dog is not a wolf and it is not a “pack” animal. It is more like a child, a student and a family member. Your dog doesn’t need you to be a “pack leader.” It needs you to take on the role of a supportive parent, a teacher and a trusted friend. In order to be these things you need to establish yourself in a position of authority through respect and trust. If you fail, your dog will never be the great companion you want it to be. Many people still think that you have to be a dominate “pack leader” and that you have to be big, bad and aggressive to control your dog. They also think that if you don’t act this way, your dog will battle you for a leadership position or take over your household. This couldn’t be further from the truth. One famous TV trainer has always said that dog’s only WANT to be a follower and have no interest in becoming a leader. If you begin the relationship with your dog by building a bond of trust and respect, it will always want to please you. After all, it’s in their DNA. Anyone can be a good leader. It is an attitude based on mutual respect and trust, not on punishment dominance or aggression.